Hickory wood is a dense and hard wood that promotes a bold flavor. Since some people think hickory by itself can be overwhelming to the light chicken meat, we recommend using a combination of a fruit wood like apple, cherry or pecan and burn half and half for a balance of smoky flavor that pairs great with chicken. Soak your hickory and apple wood chunks in water for a couple hours to allow them to smoulder instead of burn out quickly. It is important to use half hickory and half apple wood because hickory is a dense wood that can have a bitter flavor if used solely by itself on chicken. However, hickory will impart less of a bitter flavor on denser meats like beef or pork. 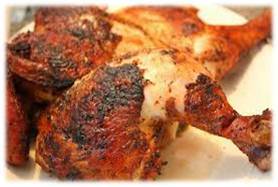 Mix all of the chicken seasonings together in a mixing bowl and rub them on the chicken. Light your smoker until it warms to 250 degrees. Place the chicken breasts on your smoker and shut your grill lid. Leave the vents on your smoker at least a quarter of a turn open. Check your chicken after an hour to make sure it is cooking correctly and that the temperature in your smoker is still holding at about 250 degrees. While you are checking the temperature, add additional hickory and apple wood. Total cooking time for a whole chicken varies but will likely be 3-4 hours. Check the internal temperature of the chicken with a meat thermometer. You are looking for a temperature of 160 degrees in the middle of the breast before you can pull it off the smoker. Once you pull your chicken off the smoker, make sure to wrap a foil tent around it for at least 20 minutes to let it rest. Cutting into meat right off the smoker will not allow the juices to redistribute and will make your meat tough.